NEW YORK, NEW YORK, USA, April 5, 2019 /EINPresswire.com/ -- Romance! Political Intrigue! Shenanigans! VHRP LIVE! closes its Fifth Season with the classic 1913 operetta Sweethearts, on Tuesday, April 30 and Wednesday, May 1, at Christ & St. Stephen’s Church, 120 W 69th Street, NYC. 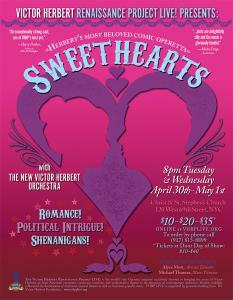 Sweethearts is one of Victor Herbert’s most beloved comic operettas, in which a handsome prince is about to take a throne, a lost princess is found, and international politicians maneuver. “On Parade,” “Sweethearts,” “For Every Lover Must Meet His Fate,” “Jeannette and Her Little Wooden Shoes,” and “In the Convent They Never Taught Me That!” were all written when Herbert was at the top of his game, a household name and America’s most famous composer. The New Victor Herbert Orchestra (NVHO) supports the company at this final show of the season.